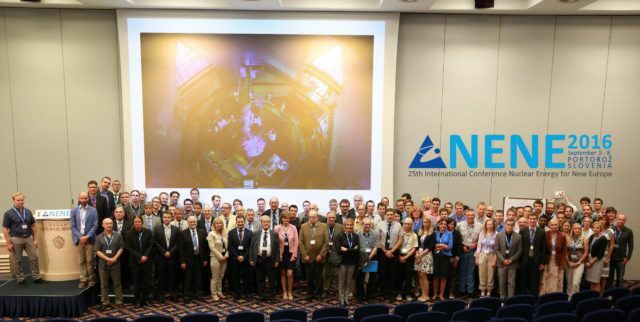 In the first week of September Grand Hotel Bernardin in Portorož hosted an International Conference Nuclear Energy for New Europe (NENE 2016), organized by the Nuclear Society of Slovenia. The traditional, already 25th meeting of Nuclear Society of Slovenia, was this year held in the amazing surrounding of Slovenian coast city of Portorož and the special attention was paid to 50 years of the Slovenian TRIGA reactor and role of research reactors to support nuclear energy. From 5th until 8th September the program of NENE 2016 covered different aspects of nuclear energy from all around Europe and worldwide with the primary objective of the meeting to foster international cooperation amongst professionals active in nuclear research and educational institutions, nuclear vendors, utilities and regulatory bodies. It attracted around 200 participants from 23 different countries and among all the 95 conference contributors, the Young Author Award was given to Bor Kos for the paper “Variance Reduction of Fusion and Fission Neutron Transport Problems using the ADVANTG Hybrid Code co-authored by Ivan Kodeli from Slovenia.